It was the Softenon disaster that made the pharmaceutical industry fully aware of the importance of knowing the enantiomeric purity and chirality of drugs and their metabolites. This disaster involved the chiral drug Thalidomide that was sold in the 1950s as a racemate under various brand names such as Contergan and Softenon. It was shown in the early 1960s that only the R-enantiomer has the intended pharmaceutical effect and that the S-enantiomer, when the drug is used by pregnant females, may lead to serious miscarriages. 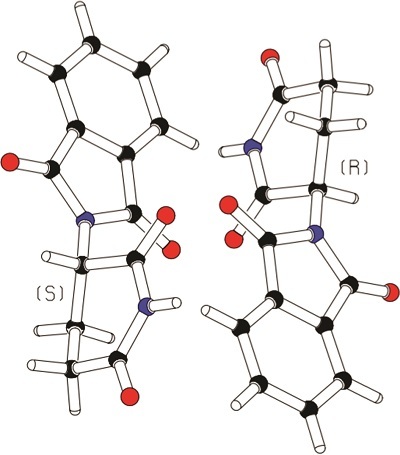 Until the 1950s, the chirality of a compound could only be determined by chemical methods. It was J. M. Bijvoet’s organic chemistry colleague, F. Kogl, working on the isolation of natural products and on a chirality-related cancer theory, who inspired Bijvoet to reinvestigate the possibility to directly determine the chirality of molecules such as natural and unnatural amino acids with X-ray diffraction techniques. The first absolute structure determination of an organic compound, as proof of the principle, was carried out for sodium rubidium (+)-tartrate in 1950. This was a significant experimental feat at the time in view of the long exposure time required. Half a century later the absolute structure assignment to sodium rubidium (+)-tartrate was reaffirmed using state-of-the-art techniques. With the advancement of the diffraction and computer hardware and the inclusion of anomalous dispersion contributions into the structure refinement software, it became customary to refine both enantiomeric models of a determined structure and keep the one with the lowest R-value as that representing the true absolute structure. Probability tests to determine the validity of the chosen absolute structure were often problematic; so work continued to improve the situation. A solution was finally resolved with the introduction of the Flack parameter. Absolute structure assignment turned out to be generally statistically reliable for compounds containing heavy atoms with significant resonant power. Unfortunately this was rarely the case for light atom structures containing only atoms of types O, N, C and H, yet absolute structure determination of light atom structures is of great interest in pharmaceutical research. To address the reliability issue a new approach was taken by Hooft et al. Subsequently, similar approaches, collectively addressed as post-refinement methods have been implemented in various software packages. In a recently published paper Watkin, D. J. & Cooper, R. I. [(2016). Acta Cryst. B72, doi: 10.1107/S2052520616012890] describe the currently available techniques for absolute structure determination.